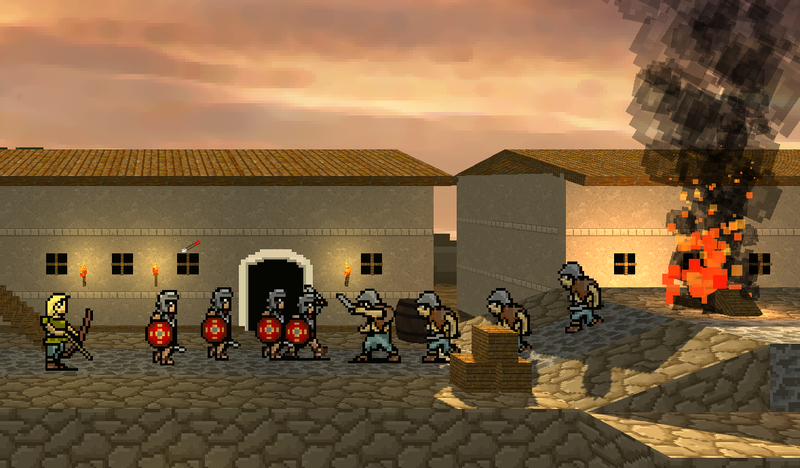 Hey all, and welcome to our first development update post for Super Roman Conquest! We’ve been working on this game for several months now, and there’s so much to talk about. But let’s start with some thoughts on PIXELS. Our style for this game is going to mix 16-bit era textures and sprites with 3D worlds and dynamic lights. We grew up playing amazing games on SNES and Genesis, so those lush, carefully drawn, 256-color images hold a soft spot in our hearts. Let me preface this — first and foremost I consider myself a scripter and a designer. “Artist” of any kind is a far and distant 3rd. Maybe 4th. It’s not my forte, though I appreciate good art greatly. However, our team being only the two of us, we’re both picking up tasks that were previously out of our wheelhouse. For myself, getting into pixel art has been fun and somewhat cathartic. At some point we’ll want to contract out artwork, but until our budget allows, I want our placeholder art to motivate us and inspire others. Anyway, here’s a dude I’m working on. He’s an Auxilia, one of the non-Roman citizens of the army, usually volunteers from regions outside Rome. In our game the Auxilia is going to be a light troop — not as badass as the Centurion or Optio, but he’ll be able to hold his own against those brutes from Gaul. Each frame is about 32×32 pixels, and these are just a few of the frames we’re using. We’ll be adding more frames later, like proper death animations for one thing. It takes a while to get the walk animations right, and I don’t think I’d ever be happy with them, but getting to the death frame is quite satisfying. I finally get to take my revenge on the sprite that tormented me with out-of-place pixels and wonky looking legs. A 2×2 image has four pixels. If you only used two colors, your possible combinations would be 2 to the 4th power. 16. A 4×4 image has sixteen pixels. Using only two colors, you’re now at 2 to the 16th. That’s 65,546 possible images on a 4×4 canvas with only two colors. Yikes! 32×32 image has 1024 pixels. 2 to the 1024th power might as well be infinity. And that’s only with two colors. Anyway, that will wrap things up tonight! Check back soon for more updates!